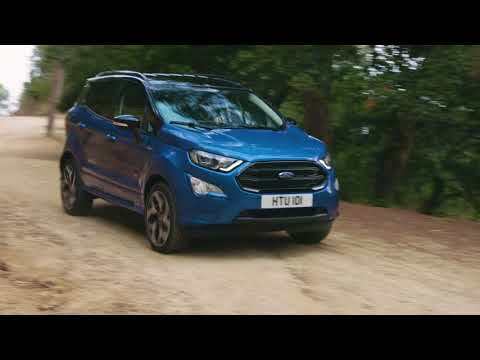 EcoSport for the first time offers Ford Intelligent All Wheel Drive technology for improved traction on- and off-road, combined with an advanced new 1.5-litre EcoBlue diesel engine, delivering up to 125 PS and optimised CO2 emissions. Also available for the first time as a sporty, Ford Performance-inspired EcoSport ST Line model, the new Ford EcoSport delivers driver assistance technologies including SYNC 3 connectivity, Cruise Control with Adjustable Speed Limiter and Rear View Camera. A 125 PS 1.5-litre EcoBlue diesel model with front-wheel drive and all-new, low-friction six-speed manual gearbox will offer even lower CO2 and greater fuel-efficiency from mid-2018. Ford’s 100 PS 1.5-litre TDCi diesel engine combined with front-wheel drive and all-new six-speed manual gearbox will be available from launch. Also offered will be Ford’s multi-award-winning 1.0-litre EcoBoost petrol in 140 PS, 125 PS and – from mid-2018 – 100 PS power outputs, with a six-speed manual gearbox; and 125 PS with a six-speed automatic gearbox featuring steering-column mounted paddle-shifters for convenient gear-shifting. The new EcoSport will continue to deliver ride and handling tuned specifically for customers in Europe, with optimised springs, dampers, spring aids, steering gear, rear axle twist beam, Electronic Stability Programme settings and steering assistance profiles. The new Ford EcoSport features bold, dynamic Ford SUV styling, reflecting that of the mid-sized Kuga and large Edge. A sculpted bonnet with a central bulge delivers a cleaner front-end appearance, supported by heated washer nozzles hidden beneath the upper bonnet lip. The front-end design is dominated by a new large trapezoidal grille design and distinctive angular headlights that are now offered with a High Intensity Discharge lighting system, and incorporate stylish LED daytime running lights. Angular fog light housings complete a front three quarter profile that was inspired by the straps of a rucksack and designed to reflect an adventurous character. EcoSport’s rear bumper and tail light designs also are revised to deliver a cleaner, more sculpted appearance. Customers can choose from 12 bold exterior colours, including Lightning Blue, Ruby Red and vibrant metallic orange shade, Tiger Eye; and can further personalise their SUV with the new contrasting extended painted roof colour option. New 17- and 18-inch alloy wheel designs complement the rugged, sporty character, and are offered in a number of finishes, including Magnetic Low Gloss, Shadow Silver, Flash Grey and High Gloss Black. Customers continue to be able to choose a distinctive, boot-mounted spare wheel option. The interior features a host of smart stowage solutions, including a new height adjustable boot floor that can be raised to provide concealed storage, or lowered to increase luggage capacity to 334 litres. A new centre console features a built-in folding, sliding passenger armrest with a storage compartment ideal for tablet computers or snacks. The new EcoSport line-up will for the first time include the sporty new EcoSport ST-Line variant, joining the Edge ST-Line, Fiesta ST-Line, Focus ST-Line, Kuga ST-Line, Mondeo ST-Line and S-MAX ST-Line models that offer bold styling and sports-tuned driving dynamics alongside powerful and efficient EcoBoost petrol and TDCi diesel engines. The EcoSport ST-Line delivers unique Ford Performance-inspired bumpers and side skirts, black-finish roof rails and headlight bezels, 17-inch Dark Tarnish alloy wheels, ST-Line badging and extended painted roof and door mirrors as standard. The interior offers a unique ST-Line leather-trimmed flat-bottomed steering wheel; unique partial leather seats featuring Miko®-Dinamica inserts – an ecological suede made from recycled polyester – and red stitching; leather handbrake lever and gear knob; ST-Line branded scuff plates; and stainless steel sports pedals. The new Ford EcoSport builds on the commanding SUV driving position and rewarding Ford driving dynamics to deliver an even easier and more enjoyable driving experience using advanced technologies. Ford’s sophisticated SYNC 3 communications and entertainment system is compatible with Apple CarPlay and Android Auto™. SYNC 3 is supported by EcoSport’s floating, 8-inch colour touchscreen, which can be operated with pinch and swipe gestures. Also offered with SYNC 3 is a floating 6.5-inch colour touchscreen. A 4.2-inch colour screen is offered in combination with Bluetooth connectivity and two USB inputs. A new B&O PLAY sound system offers an elevated audio experience; featuring ten speakers, including boot-mounted subwoofer and a mid-range speaker in the centre of the dash, the system has been specifically calibrated for EcoSport, and is controlled by the latest Digital Signal Processing Amplifier that allows for precise equalisation and audio mixing, including a Surround Sound setting. EcoSport for the first time delivers Cruise Control with Adjustable Speed Limiter that helps drivers keep within speed limits, and a Rear View Camera that makes parking more efficient and safer. Available automatic headlights and rain-sensing wipers remove some of the stresses of driving and enable customers to better concentrate on the road ahead, while a heated steering wheel and Electronic Automatic Temperature Control further improve comfort. More convenience is offered with a new 4.2-inch digital instrument cluster that makes key driving information easier to access, and power-foldable mirrors that are heated for quicker getaways on frosty mornings. Further driver assistance technologies include Ford’s Blind Spot Information System that can alert the driver to vehicles approaching alongside, and standard Roll Stability Control that adjusts engine torque and braking to help drivers maintain control. Improved occupant protection now includes driver and passenger front airbags; a driver knee airbag; new side airbags that provide extra thorax protection and are designed to direct the occupant away from an impact; and new curtain airbags that provide maximum side-impact coverage. EcoSport is also more secure than ever before, with a standard perimeter alarm.